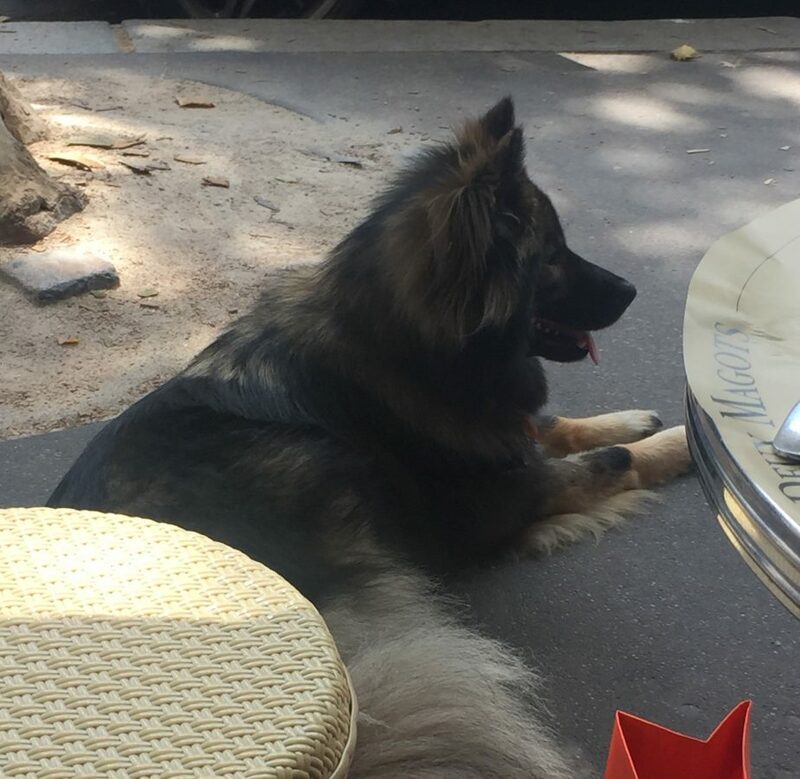 Yesterday was the perfect Paris day…idled away at sidewalk cafés… talking, eating, sipping with Carolyn Barnabo and husband Clive, new friends we met last year from England. Carolyn is a writer/blogger herself, Paris-enthusiast, and owner of a Paris apartment in the Passy area. I encourage you to enjoy her blogging at https://mysydneyparislife.wordpress.com. 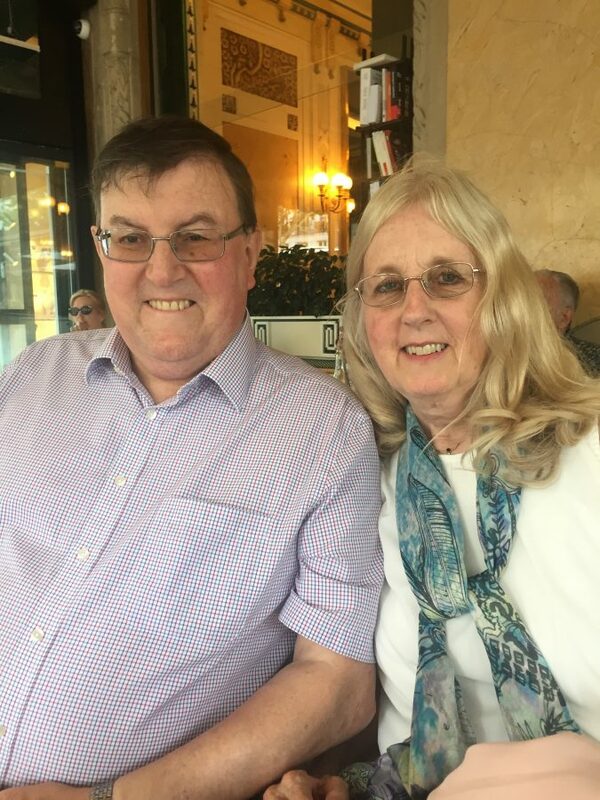 They, like us, are both retired—Carolyn from 35 years at IBM and Clive from over 20 years at CitiBank. We began at the little-known Café Fleurus right across from the west entrance to the Luxemboroug Gardens. Carolyn loves blue cheese and they have a unique Croque Monsieur made with blue cheese, maybe the only one in Paris! It’s similar to a grilled cheese sandwich with ham. 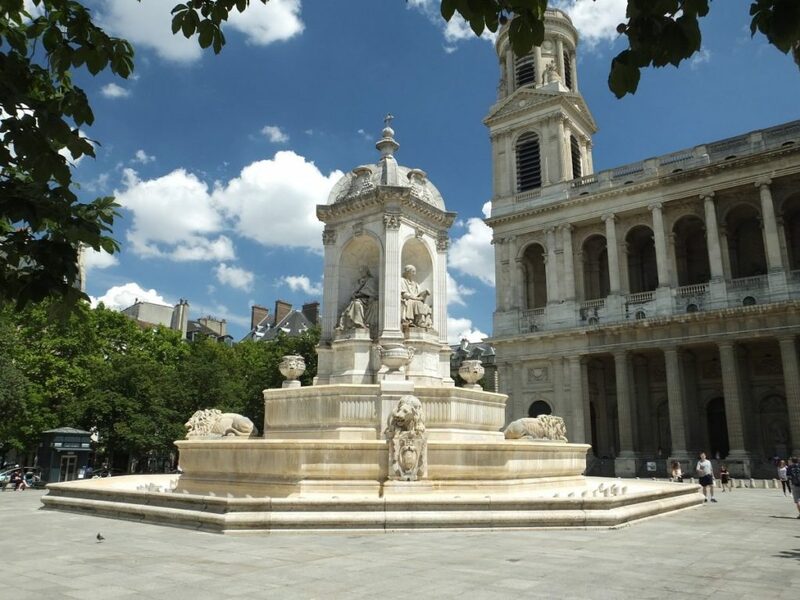 We indulged in a two-hour rendezvous there and then decided to walk past St. Sulpice church and down to Les Deux Magots, the historic meeting spot for people like Hemingway and Fitzgerald. (http://www.lesdeuxmagots.fr/en/history-restaurant-paris.html) It is one of the best for people watching. It was quite warm, but we found a shady spot and whiled away another two hours! How fun…no agenda, no place to be, no urgency. It’s our favorite Paris day, and here are some photos to bring our experience closer to you. We absconded with this special BADOT bottle to use as a flower vase at home! 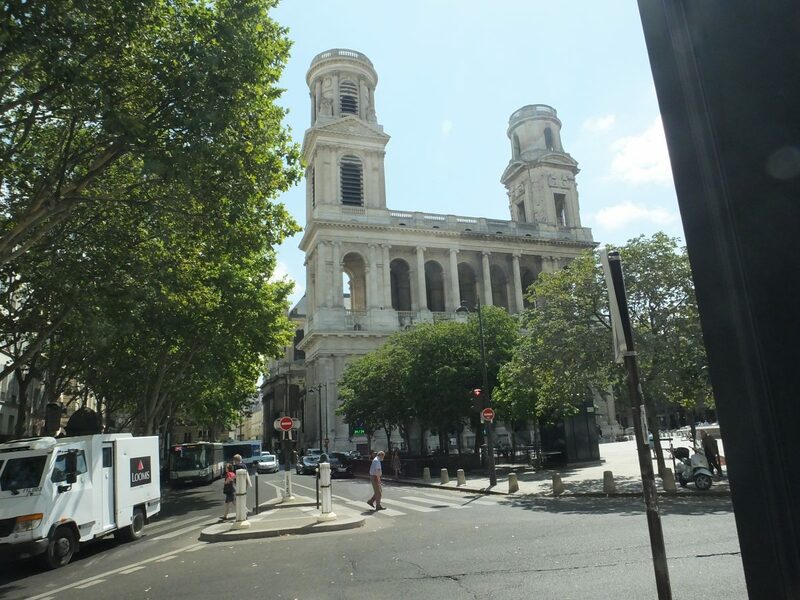 St. Sulpice church is famous for its organ and was one of the centerpieces in Dan Brown’s Da Vinci Code. There is a tiny bit of progress on my lost suitcase. I was notified by AirFrance to complete an intense inventory of the contents and cost of the items in my bag, I suppose to confirm that it is indeed mine. This morning’s new message on their tracker is that they have received the inventory. Still not a word about a delivery time or date. The really crazy part of this story is that if I had not on my own initiative found this tracker web site, I would never have gotten their messages. It is very frustrating to see how the system works. My prediction is that I might receive the bag by Friday! This afternoon at 4pm, I’m walking across the hall to my neighbor’s apartment to assist her in learning to use her computer. That’s a scary thought. Chantal is dear, and I hope to spend several hours a week trying to help. She so wants to learn but is basically starting from zero. We are supposed to receive rain this evening to cool things down. Right now we are listening to them jack-hammer our sidewalks and streets as they work to put in new “electrical.” Such a mess which we hate for soon-to-arrive company this time next week. Oh well, c’est Paris. Your readers around the world will be eagerly awaiting news of the suitcase delivery! Well done on your continued sleuthing and form-filling and tracking. How could I forget the cute waiters! Safe travels! How fortunate to be at the time of life when passing the time with friends in conversation, good food, and enjoying your surroundings is a “good day”. Looking forward to the next chapter of the missing suitcase. You and Bob must join us next year. Such wise words, Cindi! I agree! Love to Judy. Glad she is doing well. Jim, I guess that means Judy has finally gotten her new knees! I hope she has a quick recovery! It will take a year till she feels completely back to normal, but I hope she is already enjoying her freedom from pain. Tell her hi from me. 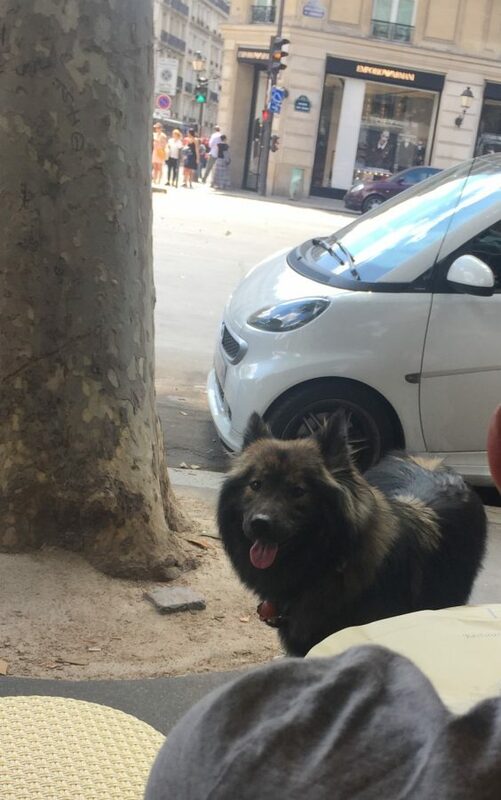 Our plan is to someday meet Carolyn and Clive in Paris for one of these leisurely days of flaneuring around the city. Yes, you must do that. They are lovely people and very well-informed about Paris. 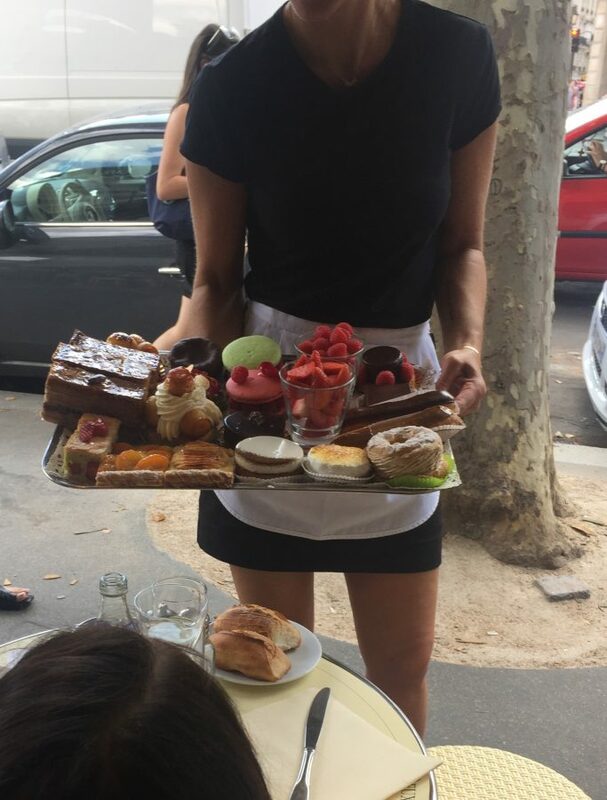 I’ll take the whole platter of desserts, thank you. Oh to be in Paris and just eat sweets!!!!! Next year, you must join us! 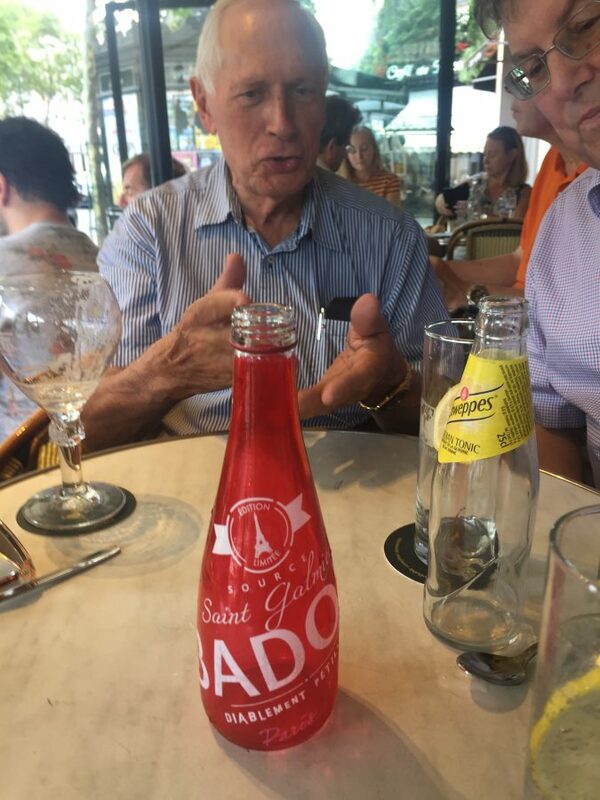 Badoit is a brand of bottled water, like Perrier. Sparkling.